1 Go to the following link and check the vocabulary to talk about physical description. Then check the following videos to review comparisons superlatives, physical description and clothes description. 2 Go the following link and do a grammar test about comparisons and superlatives. 3. Check the following listening exercises in each link. Here you have a webquest that is going to be our production activity this weekend. Follow the steps in the order they are don't omit any step. 1. Listen and watch the following video and make a list of aleast five benefits of involving your children in the making of your holiday plans. 2. Read the following articles about tips on planning holidays and prepare a description map on the elements to take into account to plan your holidays. Use the following map frame as example to make yours. and choose a destination you'd like to travel next holidays. Read carefully the description of the place, the activities and sites you can do and visit, and the facts about those destinations. 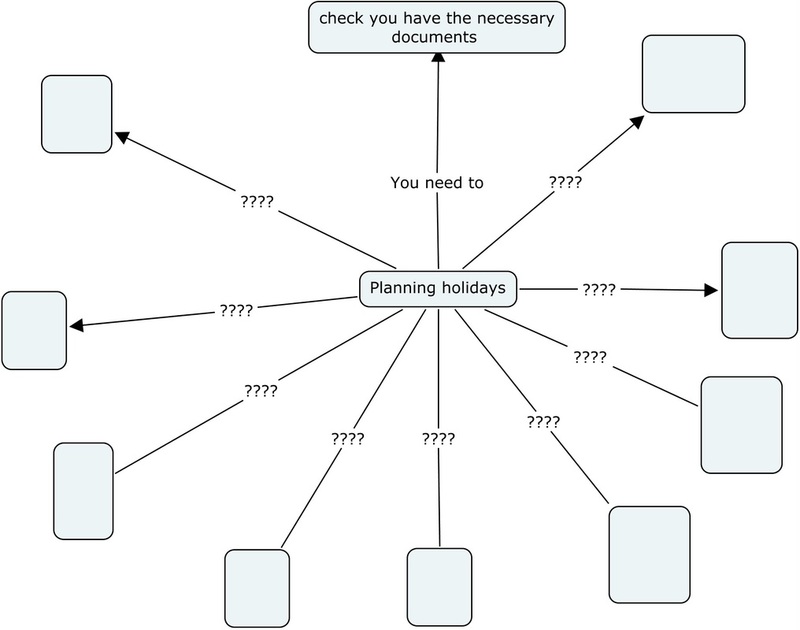 Then create another description mind map about your next holidays, taking into account the destination you have chosen and the tips you read before in step 2. Take into account that you aren't traveling alone you're going with your family include their likes and oppinions. You have to send the map to my mail (englishteacher.uis@gmail.com) maximun on Friday the 3rd of August midnight. 4. Taking into account the previous steps you are going to make a Composition about your next holidays, where you are going, why you are going there, who you are going with, what you can do there, and which places you visit. Use the mind map you made on step 3, and a recording talking about the worst holiday you've ever had. The composition, the recording, and the map on step 3 must be sent on Saturday the 4th of August midnight. 4 Videogames are a type of. 7 A bar on the beach. 8 Extremely bad or un pleasant. 11 The way of life, especially the general customs and beliefs, of a particular group of people at a particular time. 12 Not violent, and like peace. 15 Action of going to a different place, city, or a country. 20 Place where you can travel by flying. 21 A place where many people go for rest on holidays. 24 When something is dirty or poisonous. 25 Outdoor activity that you do with a tent. 26 Covered with sand or containing sand. 27 Not being well educated or polite. 28 Entertainment and social activities which happen in the evening in bars and nightclubs. 30 Awful, Very unpleasant or unacceptable. 31 When the weather is very, very hot. 1 When a hotel service is really good is a ______ ________ hotel. 3. The visiting of interesting places, especially by people on holiday. 5. A type of small magazine that contains pictures and information on a product or a company. 6. The landscape like mountains, see, rivers, hills, and lakes. 9. When you travel to san Andres islands you take a ________. 10. When you see a band playing music in a concert you see it playing _________ music. 13. The environment in a place. The party has a good ______________. 14. Something with a lot of good things and it is usually expensive. A roll Royce is a very ______ car. 16. A place to stay when you go on vacations. 19. The general appearance of the natural environment, especially when it is beautiful. 22. Something that makes you feel relaxed. 23. A present you give from a place you have visited. 29. A building where you pay to have a room to sleep in, and where you can eat meals. You'll have the quiz from Monday the 20th of August to Wednesday the 22nd midnight. Answer the following questions, giving arguments to sustain your answers. 1. Why do you think Isabel went to Europe with her aunt? 2. Why didn’t she want to get married? 3. Why did Ralph and his Father decided to give Isabel £ 70.000? 4. What was Isabel’s mistake? Why? 5. What do think it happened in the end, she came back to Italy to live with her husband, or she went away? Why? 1.1 In the same page go to the link "Text complexion quiz "section, on top of the page, and do the exercise. 2. Watch the following video about the past forms and past participles pronunciation for regular verbs. 2.1 Go to the following link and read the rules for the pronunciation for regular verbs. 2.3 Go to the following link and do the quiz. 3. Now open your books on page 157 and listen the pronunciation of the irregular past forms and past participles. 2) Here you have the corrections for the exercise 13 a and 13b from the workbook page 53. 2 Can you give me some directions? 3 There is a post office on the corner. You can't miss it. 4 How can i get to the hospital, please? 5 Carry on past the supermarket and it's on your right. 6 How long does it take to walk? 7 Walk along randall street until you get the library. 8 Turn right at the end of the street and I think that's park road. 1 A: How long does it take to walk? B: About twenty minutes I'd say. 2 A: Can you give me some directions? B: I can try. Where do you want to go? 3 A: Excuse me, do you know where park road is? B:Turn right at the end of the street and I think that's park road. 4 A: Excuse me. Where's the nearest post office? B: Go down to the end of this street, there is a post office on the corner. You can't miss it. 5 A: How can i get to the hospital, please? B: Turn left after the cafe- Look , where that ambulance is going. Read the following questions and answer them giving your opinion, supporting your ideas with accurate reasons and using simple and complex structures. Once you have finished writing your answers take your time to read them again, in order you can correct the possible mistakes or you can organize your ideas in a suitable way. The quiz must be sent to your teacher’s mail maximum on Sunday the 16th of August before 2.00 or 3:00 pm. 1) Describe the principal characters (Spencer, Suzan, and Russell Costigan, and Hawk), what you like, what you don’t like about them and possible idea of what you think their past was. (For this question use what have learn from the story to create a picture of them, describe them in their physical part and in their personality). 5) What do you think about the book? Is it good story? Do you want to read the original one or you just think far better books have been written? If the case is that you don’t like it which book would you like to read if you had the chance to choose another to be read in the English class? Why?